Crystal Dreams: 1.5 days to go!!! OMG... loosing it!!! 1.5 days to go!!! OMG... loosing it!!! It's 11:30 and I'm still up doing laundry, sorting things... oh and then there's the fact that I figured out today that I can't fit the lenses I rented in my camera backpack!!! Ughhh,.. trip to Calumet tomorrow morning.... knew I'd forget something, lets hope that is the one and only thing!!!! I know I need to go to bed, but I have so much on my mind. I'm so excited to go back to Africa, but also so hate to leave my family!!!! I had nothing to really miss last time... I may have been married, but my X, was barely a roommate. Now I have an actual Husband, Steve is so there for me!!! He's my partner, my bestest friend and my Love and Lover!!!! And Amanda wants to see me off, watch my plane take off, but she'll be in school. I love her as if she were my own. I'm so blessed to have then in my life!!! And I've never had more awesome people in my life.., I have my 2 best friends, Jamie and Anna. How lucky can I be!!! I'm afraid they will some day figure out that they are half of the same whole and that will be the end of me. LOL And of course, there's my Grindal Family!!!! I could never be prouder of them all!!! They have my love as my family as well. My dad made the company that way, as an addition to his family! That's the thing that makes Grindal Special!!! The love that goes into it and comes back out. Awesome!!! I'm also so blessed by my Aunt and Uncle. They have so been there for me through so much in my life... and since Mom died, even more so, and with Dad gone now a bit over a year, well, they are my family, advisors and just plane there for me. Over the last years of his life, Dad and I finally got close as I'd wished all my life! I use to run to the end of the block each night to meet him when he came home from work... just have those few minutes of just us time. I loved my mother and father so very much!!! Mom would have loved my going to Africa the first time and would have gone absolutely nuts about the 2nd trip,,, probably not have let me wait 3 years to go back! So know, through Aunt Adele and Uncle Ron, I will share my trip. And all of my extended family and friends! Like I said, I'm just a Damn Lucky Woman!!! Ok, enough babbling... Time to change laundry one last time and go and try to get some sleep. I need to get up in the morning and walk my girl to the bus, tomorrow and tuesday and then I have to trust Daddy to do it for me. I so love that she asks me to do it normally, not Daddy, but me. It touches my heart!!! I Dream of Africa! 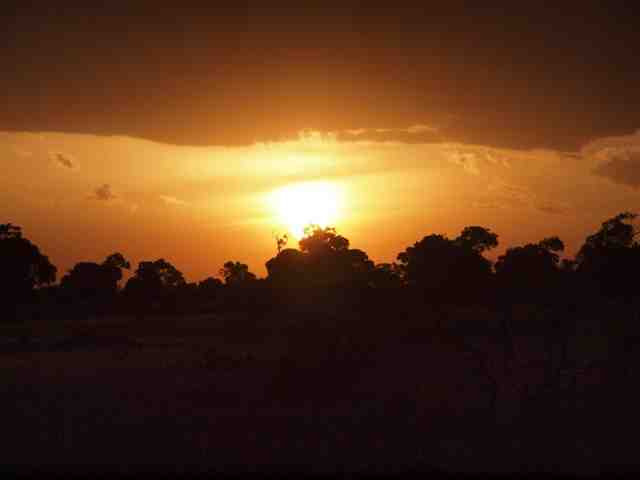 Of Sunsets on the Mara!!! They say you can choose your friends, not your family, I choose to disagree. I feel my Family and I have found each other, choose each other from heart and soul!